Today KDE released updates for its Applications and Development Platform, the third in a series of monthly stabilization updates to the 4.12 series. This release also includes an updated Plasma Workspaces 4.11.7. Both releases contain only bugfixes and translation updates, providing a safe and pleasant update for everyone. For those KDE users wishing to learn more about the forthcoming “Plasma Next” desktop work alongside KDE Frameworks 5 and Qt5, there’s new information available. Today KDE released the second alpha of Frameworks 5, part of a series of releases leading up to the final version planned for June 2014. This release includes progress since the previous alpha last month. Ubuntu derivatives have announced the first beta for 14.04 release. Since ‘daddy’ Ubuntu releases only one beta before final release the images for Unity are not available. Being a KDE user I am definitely looking forward to Kubuntu which will come with KDE Applications 4.12.2 along with newest Muon Software Center. I did notice a bug in Kubuntu beta and that’s freezing of installer if you have more than one hard drive attached to the system. I hope developers will fix this ‘deal breaking’ bug before the final release. Other betas are from Lubuntu, Xubuntu, Ubuntu Gnome and other members of Ubuntu family. The official release of Qt 5.3 is tentatively planned for April but with the feature freeze coming up we already have a good idea for the features of this next tool-kit release. Some developers have been interested in seeing Qt go back to doing feature-based releases rather than being time-based. Right now the Qt5 tool-kit is released about every six months regardless of the number of features, but generally with the Qt5 releases thus far they have also been quite heavy on features. Six month release cycles is not good enough for some developers (in either direction) but Lars Knoll decided to chime in on the discussion Monday about changing the Qt release cycle and how branching is done. Packages for the release of KDE SC 4.12.2 are available for Kubuntu 12.04LTS, 13.10 and our development release. You can get them from the Kubuntu Backports PPA. It includes an update of kde-workspace to 4.11.6. My own talk was about where KDE, both technically and socially/organizationally, is going, also resulted in quite a few questions. They ranged from “what does RTFM mean” to discussions about involvement of startups and decision making processes. Much of what I talked about won’t be new for KDE people who follow what is going on in our community quite closely. I mostly extrapolate from trends which have been visible for quite a few years. But for those who are new or less close to our community, I plan on putting it in a blog post or two over the coming days/weeks. There is news for others Cantor backends too. Now script editor load default syntax highlighting for each backend – in old versions it did not happen. And, if you push New button, the new script editor will have the default syntax highlighting working too. If you’re a KDE user, you’re probably familiar with Krunner, a launcher application. If you don’t know what I’m talking about, it’s a small popup window that appears at the top of your screen when you press “Alt+F2″, which is the default shortcut for it. Krunner allows Plasma Workspace users to perform a lot of simple as well as much complex tasks. So, if you are a KDE SC user, you must get familiar with this pretty awesome tool. The story of KDE’s user revolt is well-known. What is less well known is that, in the six years since then, KDE has been steadily regaining its user-share. KDE is happy to announce that it has been accepted as a mentoring organization for Google Summer of Code 2014. This will allow students from around the world to work with mentors on KDE software projects. Successful students will receive stipends from Google. For years, KDE software has included a semantic (relationship-based) searching infrastructure. KDE’s Semantic Search was built around concepts previously developed in a European Union-funded research project NEPOMUK which explored the use of relationships between data to improve search results. Based on these ideas, KDE’s implementation of Semantic Search made it possible to search for all pictures – taken in – a particular place. On top of that, it added text search and tagging. It appears there isn’t much of a future left to KDE’s Nepomuk framework. It’s going to be replaced going forward in the KDE land. Krita becomes one of the first open source illustration software to be greenlit for Steam. They started their campaign on 7th this month and the Steam community approved it in less than a fortnight. The Krita team is planning to integrate Big Picture, the Cloud and workshop in Gemini version. It will take some time for them to be commercially available on Steam. Today we proudly feature an interview with Bernard Gray from De Bortoli Wines, an Australian winemaking company.We spoke with Bernard Gray who has worked for the company for over 10 years in an IT project management and development role. He is, in his own words: “”a tertiary qualified programmer, and has been involved in either core development or supporting development with a few Open Source distros/projects over the years””. KDE plasma was used in creation of Oscar nominee Gravity! KDE Software has always enjoyed undisputed reputation among the Open Source users; its desktop environment continues to get voted as one of the most popular and widely used DE. KDE SC is not limited to home users, it’s used by organizations around the globe. Today, February 4, the KDE Project has announced, as expected, the second maintenance release for the stable KDE 4.12 Applications and Development Platform, as well as the sixth maintenance release of the KDE 4.11 Plasma Workspaces. Today KDE released updates for its Applications and Development Platform, the second in a series of monthly stabilization updates to the 4.12 series. This release also includes an updated Plasma Workspaces 4.11.6. Both releases contain only bugfixes and translation updates; providing a safe and pleasant update for everyone. KDE’s second update of its 4.12 series of Workspaces, Applications and Development Platform is now available in the stable repositories. A paradox lies at the center of the Linux desktop today. For all their limitations, reader polls consistently show that KDE is the single most popular desktop, preferred by just under a third of users. Yet at the same time, 40-45% use a desktop that sits on top of GNOME technology, such as GNOME3, Cinnamon, Mate, or Unity. The main addition in Homerun 1.2.0 is a second interface built atop Homerun’s collection of data sources, the Homerun Kicker launcher menu shown above. Unlike the first Homerun interface, which is designed for use on the full screen or desktop background and meant to be both mouse- and finger-friendly (you can check it out here if you’re new to Homerun or just need a memory boost), Homerun Kicker is a more traditional launcher menu design optimized for efficient use by mouse or touchscreen when placed on a panel. kate: intelligent code completion for all languages! As a result of the first article on KMail, three things emerged. First, while some users may like the semantic desktop, there is serious dislike for the semantic desktop (as has been implemented in KDE4) amongst a considerable number of other users, and these people set about disabling the software in various ways. Second, why does the implementation of the semantic desktop produce such apparent deterioration in the performance of the KDE4 desktop and what happens if you try to remove it altogether ? Third, what are some possible solutions ? This second article tries to explore those three items. This article considers some problems I had when I tried to set up and use the latest version of what I still consider is a superb email client: KMail. I believe that this package is no longer intended for the “stand-alone” user, but is firmly aimed at multi-user networks. Attention is also drawn to another far less important but still extensively used KDE4 package, the patience card-game software which I believe has been degraded due to over-development. That was exactly what I had in mind (and I assume Àlex as well), and it would be a great way to leverage one of Plasma’s biggest strengths: Flexibility, which offers choice! Of course maintaining multiple Plasmoids for the same purpose also means multiplied work, but not all Plasmoids have to be created by the core Plasma team. Everyone can write a Plasmoid for a certain purpose, add the X-Plasma-Provides line to the desktop file and thereby plug it right into this system! With this in place, whenever a user complains that a Plasmoid is either too complex or offers too little choice and an alternative exists, we can point them to it and they can easily switch. The developer of the beautiful and attractive Nitrux, Compass, and Flatter icon themes is preparing an ARM mini-computer called QtBox and designed to be portable, small (8.8cm x 8.8cm x 8.3cm), running the Nitrux 1.0 operating system and using the eye-candy KDE 4.12 desktop environment. One of the great things about KDE theming is the fact that the middle man is cut out of the deal. Many theming features invite you to browse different theming possibilities right where you sit. You don’t have to find the websites and the themes; KDE is built to let you choose those things right inside the app. This is pretty cool. From there you can download and install it right from the same GUI. As usual I try to improve sieve support in KMail. In 4.9, I fixed the dialogbox for managing them. In 4.10, I added a good text editor with highlighting and auto-completion. In 4.12 I added sieve script parsing and an UI to create sieve script even if you didn’t know sieve language. Last week I have been in Barcelona at the KDevelop / Kate sprint with all the other nice people working on those projects. As always, it was very cool to meet everyone again and spend a week together improving software. A big thanks to the organizers and sponsors, too! THE “BIG THREE”, namely GNOME, KDE, and XFCE, are not the only games in town. Now we have Defora , Moonlight , and Ome , not to mention LXLE [4,5] and Enlightenment, which recently released E18 [6-8] and will soon release E19 . There are several other desktop environments that continues to be developed, whereas several perished over the years. Speaking for myself, I recently switched from KDE to Enlightenment on the desktop where I write articles. Enlightenment is a fantastic desktop environment even for relatively new desktops, especially if memory becomes a constraint and speed can use some significant improvement. There are bugs, sure, as well as ‘missing’ features, but this desktop environment which I used regularly over a decade ago is still very light and powerful. Without it, I would have no choice but to cope with bloat, pretty much like in Microsoft and Apple land. If you have not yet found the perfect open-source desktop match for your needs, the desktop environment born out of DeforaOS is yet another option. This desktop environment is built using GTK2 and part of a larger effort to provide “ubiquitous, secure and transparent access to one’s resources” and to work regardless of form factor. Moonlight is a project still in its early stages and likely will fade away like the many other third-party desktop environments with limited manpower and scope. Moonlight Desktop is trying to be a lightweight desktop for the Raspberry Pi and other low-powered, low-end, old devices — similar in scope to Xfce, LXDE, Enlightenment, etc. They really don’t seem to be far along at all right now and are still working towards an appearance for their desktop. Originally the developer behind Ome was set out on making his own operating system and was thinking of using LLVM IR for its application binary while making the packages like Android’s APK files. He had posted to the LLVM mailing list last month for feedback on these plans but now today he’s posted a new LLVM mailing list message. I have not been a happy user of Ubuntu since the shift to the Unity desktop. Even the Lubuntu version has some bothersome Ubuntu traits attached. Enter the LXLE distro with its Lubuntu-less appearance. It provides a Long Term Support advantage over using Lubuntu and has a larger and more useful default application set. Even on poorly endowed hardware, this distro boots in less than 1 minute. The development team behind the Enlightenment project, an open source, powerful, lightweight, and eye-candy desktop environment for the X window system has announced the third maintenance release of the stable Enlightenment 0.18 branch, which includes various fixes and improvements. Just one year after the long-time coming official release of Enlightenment 0.17 (E17), Enlightenment 0.18 has been released! The freeze for E19 will begin in one month, on 28 Feb 2014. After that point, I am likely to reject most* requests for feature additions, and I will be shifting into release mode. Today KDE released updates for its Applications and Development Platform, the first in a series of monthly stabilization updates to the 4.12 series. Starting with the next Applications and Development Platform release, 4.12.2, there will also be a maintenance release of Workspaces 4.11.6. This release contains only bugfixes and translation updates; it will be a safe and pleasant update for everyone. The Plasma team is meeting in Barcelona, Spain these days to work on the next major version of KDE’s popular workspaces. As we are in a transition period, technically and organisationally, this is a very important meeting. I won’t go into too many details in this post, as they are still being fleshed out, but to give you an idea what we are talking about, here’s a quick run-down of some of the things we talked about. conf.kde.in was announced in November, to take place February 21 – 23, 2014 in Gandhinagar, India. This three-day conference, the biggest KDE event in India, will bring together Qt developers, KDE contributors, open source enthusiasts and users from all across the nation. Visitors will have the opportunity to learn, share, contribute, innovate and create around Qt and KDE technology. In the second week of January, KDE’s Plasma team gathered in the Blue Systems office in Barcelona, Spain, to discuss and work on the next generation of KDE’s popular workspace products. The meeting comes just at the right time, as the Plasma team has just finished a first technology preview, which puts the base technology in place and allows for an evaluation of the current progress. It also gives an opportunity for more refined plans for a first stable release. Akregator is the default KDE RSS/Atom feed reader and it does it very well. Without being bloated with a lot of features, Akregator takes a rather simple approach, yet providing all the needed features one would expect from a feed reader. You have an integrated web browser, tabs, feed fetching interval configuration, feed archiving, system tray notifications and a few other notable features shown below. Akregator is part of the KDE Kontact Suite. What to do after the last image? If you have used Gwenview before KDE SC 4.11 you might be familiar with the following situation: you are running Gwenview in fullscreen mode, pressing Space to go through a folder full of images. At one point, pressing Space does not do anything anymore… What’s wrong? A quick move of the mouse to bring up the fullscreen bar reveals that you are on the last image. The Calligra team is proud and pleased to announce the second beta release of version 2.8 of the Calligra Suite for testing! The team will now focus on fixing remaining bugs. Let’s make sure the final release of 2.8, expected by the end of January is as stable as possible by giving the current beta a good testing! Mesa contributor and KDE developer Fredrik Höglund has been working on support within Mesa for GL_ARB_multi_bind. This OpenGL 4.4 extension is implemented across eighteen patches and Fredrik hopes to land the support next week. In May of this year, our project to place refurbished computers into the homes of disadvantaged kids will turn nine years old. Aside from an extremely short-lived and disastrous trial with Microsoft Windows in the beginning, Reglue (formally HeliOS) has depended on Linux to power those computers and we’ve used a number of distros over the years. KDE’s leadership is an opportunity to extend free and open technology, providing creative minds unlimited room to innovate. Mainstream tech companies try to do this without disrupting their profits or stock prices. We are fortunate to have such freedom. Apple is a liar that has done nothing for Free/Open Source software except take it and then sue its original developers (and/or their clients). Anyone who still believes the fiction of Apple as an “Open Source” supporter (as their Web site and PR agents/fans try to tell us) is just not keeping a grip on reality and may therefore fall for this schmoozing campaign from last week . 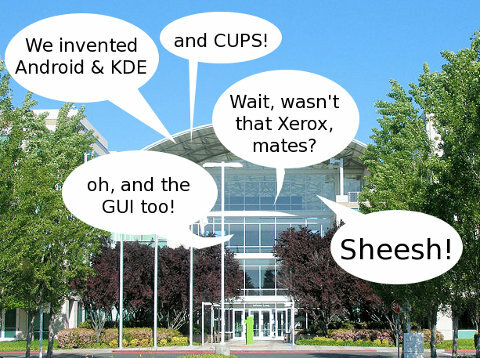 Yes, Apple is trying to approach KDE developers now. FOSS developers should send Apple’s E-mails where the sun does not shine. Apple does many other bad things, but we need not look further than just Apple’s betrayal and exploitation of FOSS in this context. As detailed in a recent article in the New York Times, Apple is flipping out over an outside monitor nosing around in its business. The technology giant has spent the last several months pulling out all the stops to keep one Michael R. Bromwich, a Washington lawyer appointed by a federal judge to ensure Apple’s compliance with antitrust laws, from doing his job. Most absurd, Apple claims that if Bromwich is not stopped, the company will no longer be able to innovate and create new products. What a hoot! If Apple was really eager to innovate and create new products, perhaps it would stop doing stock buybacks to enrich executives and devote some of the Mt. Fuji of cash it is sitting on to R&D. The judge who appointed the monitor is not amused by Apple’s antics. The NYT reports that at a Jan. 13 hearing in Manhattan, Judge Denise Cote “told Apple and its lawyers to stop wasting time and start cooperating with the monitor.” Apple’s lawyer retorted that the company planned to continue its fight to unseat Bromwich with an appellate court. This is getting quite nasty. The Wall Street Journal huffed that the judge was mean and bad, too. If only these people would go back to doing nothing and leave big business in peace. The KDE Community is proud to announce a Tech Preview of KDE Frameworks 5. Frameworks 5 is the result of almost three years of work to plan, modularize, review and port the set of libraries previously known as KDElibs or KDE Platform 4 into a set of Qt Addons with well-defined dependencies and abilities, ready for Qt 5. This gives the Qt ecosystem a powerful set of drop-in libraries providing additional functionality for a wide variety of tasks and platforms, based on over 15 years of KDE experience in building applications. Today, all the Frameworks are available in Tech Preview mode; a final release is planned for the first half of 2014. Some Tech Preview addons (notably KArchive and Threadweaver) are more mature than others at this time. we (some of us at Digia) have been working on Enginio – a convenient cloud storage for Qt applications. Since the library is actively maintained we would like to integrate it into the official Qt release for Qt 5.3. Dirk Hohndel of Intel’s Open-Source Technology Center has talked at length on his experiences in the GTK and Qt tool-kits, including what he views as the biggest problem with GTK. There will be a a panel discussion with the governing bodies of the GNOME Foundation and KDE e.V. (the association that supports KDE), a presentation about KDE Frameworks 5, and a personal account of challenges and triumphs—”Do you have to be brain damaged to care about desktop Linux?. The second edition of India’s KDE conference – conf.kde will be held in February in Gandhinagar. The event will start at 2pm on Feb 21 and end at 5pm on Feb 23. The organizers have opted to hold the conference at the Dhirubhai Ambani Institute of Information and Communication Technology (DA-IICT) which also hosted the KDE Meetup last year. Registrations are open with early bird discounts on offer till Jan 15. FOR a period of time a couple of years ago Wayland made some headlines; Canonical has since then moved on to its own (with Canonical copyrights) X Server replacement, so Wayland did not make many headlines in 2013. But Wayland is making a bit of a comeback, not in Unity or GNOME (which now has version 3.11.3 in focus [1,2,3]) but in KDE. KDE 4.12 was recently made available , potentially attracting many news users . With the leadership of BlueSystem there is a shift towards Wayland , which becomes ever more real in the Qt- and Wayland-Powered Hawaii 0.2 Desktop [7,8]. The GNOME developers announced recently yet another development release towards Eye of GNOME 3.12, the default image viewer application for the upcoming GNOME 3.12 desktop environment. The GNOME developers behind the GDM (GNOME Display Manager) software have announced a few days ago the immediate availability for download and testing of version 3.11.3 of the default login manager app for the GNOME desktop environment. The GNOME Project has announced a few days ago that a new development release towards the stable GNOME Software 3.12 application for the GNOME desktop environment is available for download and testing, introducing two new features and lots of bugfixes. The Majority of the changes for this release can be found in the excellent selection of KDE applications. Several applications come with new features and increased stability. If you want to see the latest improvements for KDE 4.12, we have all the exciting details. Why Do Users Choose KDE? Popularity polls for software are questionable indicators at best. However, with KDE receiving just under a third of the votes in LinuxQuestion’s Members Choice for 2011 and 2012 and in Linux Journal’s 2013 Readers’ Choice Awards, there’s enough consistency to call KDE the most popular Linux desktop environment. Admittedly, if you add all the choices that use GNOME technology (Cinnamon, GNOME, Mate, and Unity), then KDE loses its position. But if you consider a desktop environment as a combination of both the shell and the underlying technology, KDE’s position is unchallenged. At a time when half a dozen choices are available, KDE’s one-third is probably as close to dominance as any desktop is likely to get. It’s now almost one year since I started my job at BlueSystem to work full time on KDE software. It’s a perfect time to look back and do some retrospection as well as trying to look into the future. Of course my focus of work was on KWin, but especially over the last months I worked all over the KDE workspaces. Overall we have achieved a great result. KWin is running in near production-ready quality after the port to Qt 5 and the Plasma workspaces are also in a very good shape already. I tend to mentially compare the experience with the state of Plasma 1 six years ago which was just a few weeks before the first release. We are in a better state and there is still lots of time till we will do our Plasma 2 release. The Maui project have released a completely new Wayland powered desktop named Hawaii 0.2, which promises to bring a new generation of desktop experience for GNU/Linux users. This desktop promises to bring a completely new out of box experience GNU experience for users and ships the latest and greatest open source software out there. The desktop environment uses Qt 5.2 as the toolkit backed by qtwayland module.